The long history of southern Italy in its various incarnations as the Kingdom of Naples and the Kingdom of the Two Sicilies —down through the swirl of Arabs, Normans, Germans, French and Spanish— is preserved in the State Archives. The massive building that now houses the State Archives was originally the Benedictine monastery of Saints Severino and Sossio and is in the heart of the old city (photo, below), near the intersection of Via dei Librai ("Spaccanapoli") and Via Duomo. The monastery was one of the largest in the city and also one of the oldest, dating back to the 10th century. It was also known as the "cloister of the plane tree" as legend has it that the original building was erected in a grove of trees of that species (platanus), a specimen of which had been given to St. Benedict, himself. The history of the first few centuries of the monastery remains obscure (but see part 2, the section immediately below, on this page); true enlargement of the premises started in the 1400s. Within the modern building are to be found works of art depicting the history of the Benedictine order. The Second World War caused great damage to the archives, almost none of it from the unintentional ravages of war —accidental bombings, that sort of thing. (See Air Raids on Naples in WWII.) Most of it was gratuitous vandalism on a vast scale by the retreating German army as it left Naples in late September, 1943. It wasn’t even a "scorched earth" policy (since that has the strategic value of denying potentially useful resources to the enemy. “Scorched earth” would cover the German destruction of the port of Naples before they retreated; that was to render the largest port in Italy useless to the Allies. It didn’t work, by the way; Allied engineers had the port up and running in one week!) This was just book burning, plain and simple. It was mindless destruction of culture in order to “punish” Italy for having surrendered to the Allies in September '43. The destruction extended even to incinerating a separate 200,000-volume collection of the Royal Society in Naples and setting fire to much of the Frederick II University of Naples, one of the oldest in Europe. Especially affected in the archives were documents dealing with Angevin and Aragonese history of the city —that is, the 14th and 15th centuries. The vandals even destroyed archives that had been moved to Capua at the behest of Benedetto Croce to protect them from bombing. In the absence of much original documentation, historians have had to rely on secondary sources, which is to say the later Spanish and Bourbon documentation about the history of the city and kingdom as they found it when their turn came to rule. One thinks here particularly of such things as the detailed inventory of personal property and real estate in the kingdom undertaken by Charles III of Bourbon when he assumed the throne of Naples in the 1730s. Before that, some records survive of the Royal Chamber of the "Sommaria," a medieval commission that kept track of state expenses; as well, there are records of feudal inheritances. Some records of the activities of the two centuries as a Spanish vice-realm survive, as well as the short-lived Austrian vice-realm in the early 1700s. Various sources exist, also, from the 1700s that document the rather complicated relationship between the Kingdom of Naples and the Vatican States. As well, there is documentation from the important French period under Murat and the introduction into the kingdom of the legal system known as the "Napoleonic Code," at least some of which remained intact even after the restoration of the Bourbon monarchy in 1815. Since WW2, in order to compensate in some way for the wanton destruction of so many documents, attempts have been made to search out material in private hands locally as well as to bring back to Naples some of the documentation from abroad, such as the papers that the Bourbons took with them when they went into exile after the unification of Italy in 1861. The adjacent church that one sees today is the result of centuries of construction and reconstruction between the 1400s and the late 1700s. The interior of the church contains works by Belisario Corenzio and Cosimo Fanzago, among many others. To emphasize the age of the church, it is older than the kingdom of Naples, itself, and its "foundation" in the 10th century was really just a move from an earlier location that the Benedictine order had, a monastery referred to in historical sources as the "Lucullan monastery" since it was somewhere on the gigantic "villa of Lucullus". (See part 2, the section immediately below, on this page.) Thus, the church/monastery has undergone all the vicissitudes of the many dynastic changes in Naples, being in favor one century and perhaps less so in the next. At its height of importance and splendor, the complex was known for its beauty and wealth and was even the goal of pilgrimages from abroad. It has been pillaged on a few occasions, as well, including once by the returning royalist forces of Cardinal Ruffo, which had retaken the city from revolutionaries in 1799. There were closures and reopenings during and after the Napoleonic wars and, as noted, the Benedictines had to give up the monastery in 1835. They finally left the church, itself, after the unification of Italy. It is currently in the hands of lay confraternity and is not open regularly. The original Lucullan monastery of the order of San Severino, forerunner of the larger monastic complex described (part 1-above), was built between the years 492 and 496. It was dedicated to San Severino (known in English as Severinus of Noricum (c.410–482), Noricum being an ancient name for part of what is now Austria. Severinus is said to have been born in southern Italy or possibly northern Africa and been so taken with early Christian monasticsm that he went north to Noricum to convert the population. He died in Faviana (today, Mautern an der Donau in northern Austria) and a few years later his disciples were driven from Noricum and fled to Italy, eventually settling in Naples on property even then known to have belonged centuries earlier to the great Roman general Lucius Licinius Lucullus (c.117-56/57 BC). Lucullus eventually retired to a life of legendary extravagance, which fact has given us the expression "Lucullan splendor". 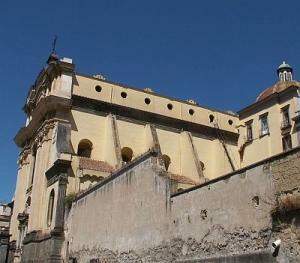 It is not certain exactly how much property he had in Naples, but it is said to have included the island of Megaride (where the Egg Castle now stands), the property on the mainland directly in front and up on top of what is now the Pizzofalcone cliff and then extending to the east past where the Royal Palace now stands to the land in front of what is today the Maschio Angioino. At least one authoritative text on San Severino, the holdings of Lucullus and the possible location of the original monastery is Memorie dell'antico Cenobio Lucullano di S. Severino abate in Napoli lette il 22 Febbraio 1869 nelo pontificia accademia Tiberina dal socio residente Gennaro Aspreno Galante [Recollections of the ancient Lucullan monastery of San Severino, abbot in Naples, read on 22 February 1869 at the Tiberina Pontifical Academy by resident member Gennaro Aspreno Galante. The book is relatively short (48 pages) and was read in its entirety on the date indicated. The first few sections present the origins of Severinus and his order, beyond my particular immediate objective (the location of the original monastery), but Galante does stress the sad fact that so much documentation on the early history of Christian monasticism in Italy has gone missing though centuries of devastation and war. He says that the monastery of San Severino in Naples was at the foundations of western monasticism just like the well-known monastery at Monte Cassino. (The author, Galante did not live to see the 1944 destruction of that famous structure through aerial bombardment, nor witness its amazing rebuilding, for the third time in its history! The Naples monastery has had no such miraculous history of destruction and resurrection; it has simply been erased into the layers, the palimpsest, of Neapolitan topography. There is nothing there.) Galante mentions the move in the tenth century when the order relocated about a mile inland to the large complex described in part 1 (above). The last half of Galante's work is dedicated to trying to place the location of the original monastery. It was bad enough for Galante, writing in 1869, to try to figure out the lay of the land in Naples of the late 400s. His points of reference —modern (for 1869) street names, churches, etc.— are difficult to follow today since much of the city was rebuilt between 1885 and 1915 (see Risanamento), but it's possible. First, Galante tries to clarify just what properties Lucullus owned in Naples and how confusion on that point has led to different histories being written of important historical events. For example, when we read that the last emperor of the Western Roman Empire, Romulus Augustus, was exiled to Naples in 475 by the Goths, specifically to the former "estate" of Lucullus, some historians take that to mean way out near Baia at the western end of the gulf, since Lucullus is said by some to have owned property there. That is not the majority view, however. Galante summarizes all of the coastal areas from Castel Nuovo (i.e. Maschio Angioino, directly in front of the main passenger port of Naples) to Megaride (the Egg Castle island) to Nisida (the small island at the beginning of the bay of Pozzuoli) and Balneolano (Bagnoli) to Miseno at end of the gulf of Naples. The author presents and represents the traditional and very strong case that Lucullus owned almost nothing out in that direction, and, indeed, when one says the Castrum Lucullum or "villa" or "estate" of Lucullus in Naples, it means not just a simple castle, but a collection of buildings, a settlement unto itself. Galante even uses the term oppidum (a strange linguistic holdover since that term is usually used to refer to pre-Roman Iron Age settlements). Galante says that Lucullus had vast holdings, more or less as described in the first paragraph, above —that is, centered around Megaride. If you are asking, How did one man own so much property? — remember that this was before Julius Caesar and the Age of Empire. Lucullus was a contemporary of Lucius Cornelius Sulla, the man who won the Social War in 100 BC and made possible the real unity of peninsular Italy as Rome. Lucullus was instrumental in that and was rewarded very well. land that used to belong to Lucullus and concludes that the original monastery of San Severino was slightly in front of where the Maschio Angioino now stands. That is, where they are just putting some finishing touches on the new Metro subway station. They keep pulling up ancient bits and pieces. Maybe there's a monastery down there. Many thanks to research super-hero, Selene Salvi, of Napoli Underground for finding me a copy of Galante's book!